A day for those who like their hurling physical and low-scoring. 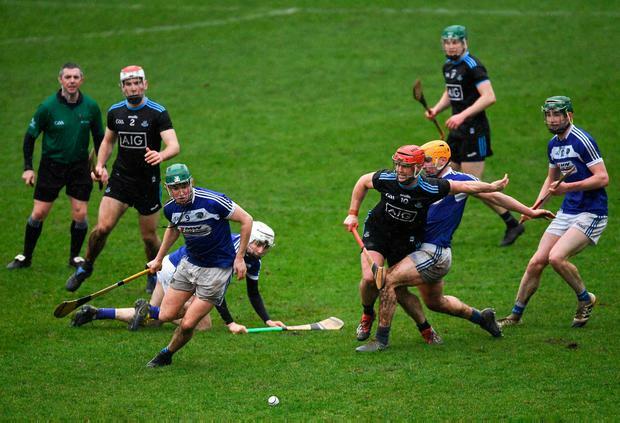 In Parnell Park yesterday, Dublin concluded their Division 1B programme with a two-point victory over Laois, who nevertheless joined their hosts in the Division 1 quarter-finals as a consequence of results elsewhere. Beforehand, referee Liam Gordon conducted two separate pitch inspections prior to deeming the playing surface sufficiently stable to proceed. Clearly, it was a marginal call. 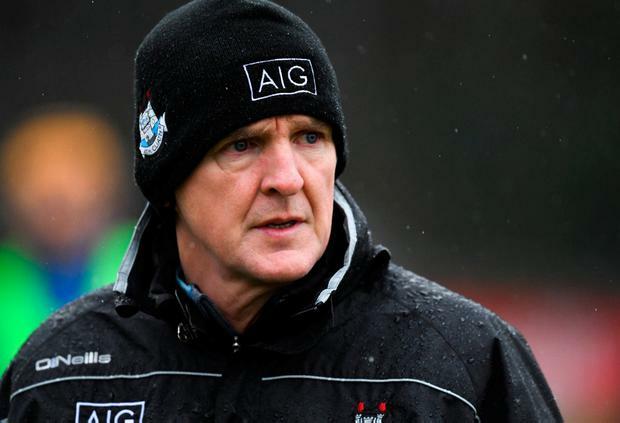 "You're always going to be challenged along the way," observed Mattie Kenny, whose Dublin team could yet top 1B if Waterford beat Galway in their rescheduled match. "Whether it's by your opponent, or decisions going against you, or in today's case - the conditions. "You're looking for the reaction of the players. "There's always things to be learned. And you always look for the character of the player coming out in different ways. And while it wasn't pretty, I thought Dublin showed really good character there in the last 20 minutes." A late brace from the rejuvenated Danny Sutcliffe helped Dublin chisel the victory amid rapidly deteriorating underfoot conditions. 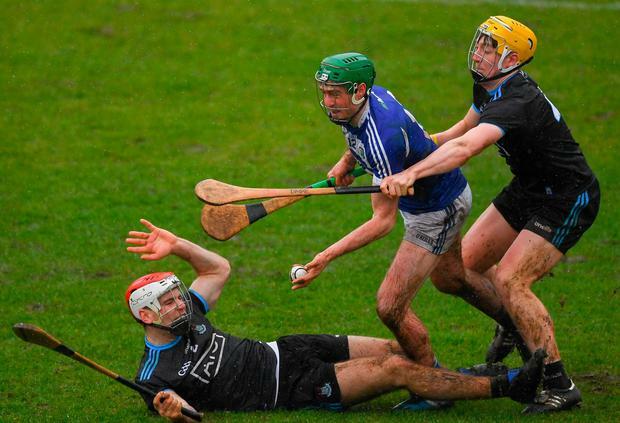 By the end, any sudden change in direction or attempt to stop mid sprint caused players to fall theatrically, taking muddy chunks of Parnell Park up with them. Dublin's calmness at the death was commendable then, despite a slow start. For Laois, the day was speckled with contrasting emotions. Offaly's somewhat surprising victory over Carlow meant Eddie Brennan's team achieved a spot in the Division 1 quarter-finals despite losing, thus avoiding the early-season stress of having to face a relegation play-off. Yet they led for most of yesterday's match and only really ceded the advantage to Dublin after Cha Dwyer's dismissal for a second yellow card. Hence, Laois managed to go the final 20 minutes of the game without registering a score, while Dublin found a couple of important moments of cohesion. 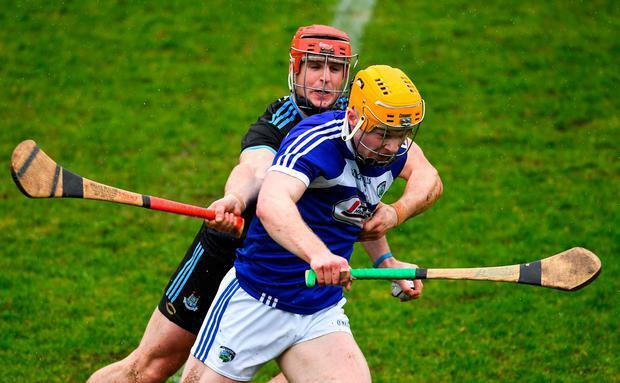 They had six points on the board by the 14th minute, each score from a different Laois player, and can count themselves unfortunate to have encountered Dublin goalkeeper Seán Brennan in yesterday's form. On what was his league debut, the Cuala 'keeper made three excellent saves in that first half, the pick of which was a close-range reflex stop when Stephen 'Picky' Maher unexpectedly flicked a short-dropping ball towards the Dublin goal. Brennan's interventions kept the scoreline tight, a situation that prevailed right to the end. By that stage, Oisín O'Rorke had added bite to Dublin's inside line, while the switch of Sutcliffe to full-forward bore the intended fruit, even if Kenny was inclined to commend those who toiled in the less glamorous aspects of Dublin's performance. "I thought Liam Rushe was immense today with the amount of ball he got," Kenny (left) noted. "Liam was obviously picked at full-forward, but he came out around the half-forward line and he was getting on some amount of ball and getting in some amount of tackles. "So in the last quarter, we moved Danny up full-forward. Oisín was after coming on. I thought Oisín was really sharp. "And Danny got those few vital scores for us. They worked very well in that final quarter." "Our lads dug in and dug deep," Kenny added. Scorers - Dublin: D Sutcliffe, D Treacy (3f) 0-3 each; O O'Rorke, S Moran (1f, 1 '65) 0-2 each; S Barrett, J Hetherton, C Boland 0-1 each. Laois: M Kavanagh 0-4 (3f); C Dwyer 0-2; E Rowland (f), S Downey, A Dunphy, P Purcell, W Dunphy 0-1 each. 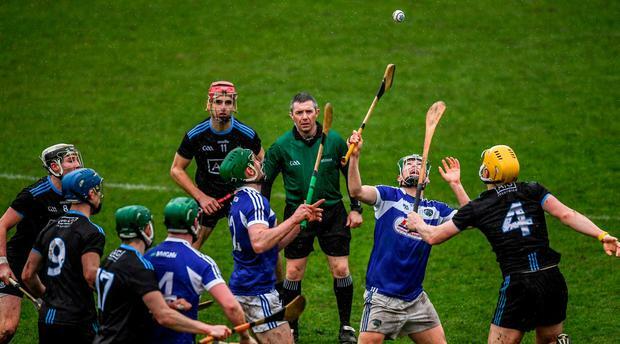 Dublin - S Brennan 8; P Smyth 7, E O'Donnell 7, J Madden 7; D Gray 6, S Moran 8, S Barrett 6; J Malone 6, R McBride 8; J Hetherton 6, D Sutcliffe 8, D Treacy 7; P Ryan 5, L Rushe 8, D Burke 5. Subs: O O'Rorke 7 for Ryan (h-t), C Boland 7 for Malone (47), E Dillon 6 for Burke (47), R Hayes 6 for Hetherton (53), F Whitely 6 for Treacy (66). Laois - E Rowland 7; J Phelan 6, M Whelan 7, D Hartnett 6; P Delaney 6, R Mullaney 7, L Cleere 7; S Downey 7, W Dunphy 6; A Dunphy 7, M Kavanagh 7, C Dwyer 7; P Purcell 7, N Foyle 5, S Maher 6. Subs: S Bergin 6 for W Dunphy (23 inj), J Kelly 6 for Maher (52), P Keating 6 for Foyle (62), C Phelan 6 for Downey (73).